This keyguard snaps on theBigKeys LX keyboard. 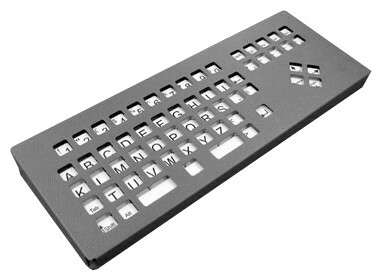 It is a metal stencil that covers all the keyboard surface, exposing the individual keys. This adaptation is ideal for people with limited mobility. On one hand, it facilitates the keystrokes even if the user has poor control of fine motion. On the other, the hands can rest on the keyboard without activating any keys accidentally. See also the methacrylate keyguard.